Pro Tools | HD Native is a new generation of Pro Tools | HD system that enables you to compose, record, edit, and mix music and/or sound for picture”with great speed and ease. Consisting of an HD Native Thunderbolt interface or PCIe core card, Pro Tools HD | Software, and Pro Tools | HD Series interface, Pro Tools | HD Native harnesses the power of your Mac or PC to deliver pristine sound, incredible performance, and the lowest latency of any host-based DAW. 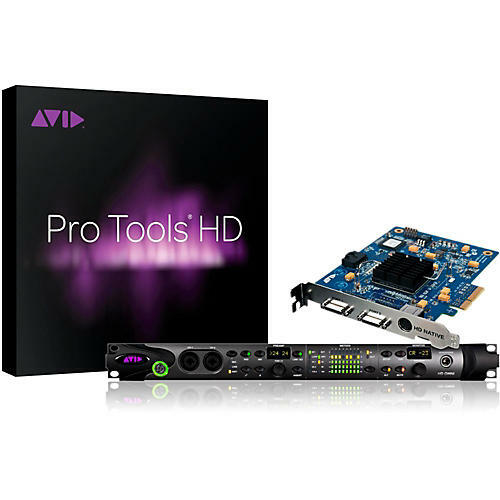 Unlike USB- or FireWire-based DAWs, which are inherently prone to latency, Pro Tools | HD Native employs either a high-speed Thunderbolt interface or PCIe core card to connect Pro Tools HD | Series interfaces with your laptop or desktop computer. By eliminating distracting monitor latency while recording, increasing your I/O capabilities, and providing 64-bit floating-point processing for more headroom and a higher mix resolution, you get a professional native solution that meets the highest audio standards. HD OMNI is an all-in-one professional preamp, I/O, and monitoring interface for Pro Tools | HD family systems. Capture pristine, high-resolution audio through premium mic preamps, connect your gear to a wide array of analog and digital I/O, and monitor your sessions in up to 7.1 surround”with ultra-low latency”all in one compact, cost-effective interface. Get premium sound and ultra-low latency through state- of-the-art A/D and D/A conversion. Record and monitor performances through 2 premium, mic/DI preamps, 4 line inputs, and 8 line outputs. Get 8 channels of ADAT I/O, 2x8 channels of AES/EBU I/O, and 2 channels of S/PDIF I/O. Experience top performance, thanks to tight integration with Pro Tools | HD for full routing, mixing, and monitoring control. Get support for 4x8 analog audio streams, or 8x8 including digital. Whether you'e tracking multiple inputs or mixing hundreds of tracks, Pro Tools | HD Native tightly integrates with your computer™s CPU to keep up with your project™s highest demands”without compromise. Choose the HD Native card if you have a PCIe-equipped Mac or PC, or the HD Native Thunderbolt interface, which features a powerful audiophile-grade headphone output for easy monitoring, for Thunderbolt-equipped desktop and laptop computers. Get pristine audio fidelity and clarity when you record and play back through a Pro Tools | HD Series interface. These critically-acclaimed interfaces offer state-of-the-art A/D and D/A conversion, premium analog circuitry, high-quality/low-noise I/O, and meticulous designs to capture and reproduce the full, natural sound of your original source, so you hear all of the character and nuances that make it unique. With Pro Tools | HD Native, you can create great sounding, studio-quality productions at up to 32-bit, 192 kHz audio resolution. And with 64-bit floating-point processing, you gain more headroom for your mix, enabling you to flex your creativity and maintain audio clarity”without fear of overloading the mix bus. So go ahead and pile on the plug-ins to get the sound you really want. What happens when you combine best-in-class audio conversion with a high-speed Thunderbolt or PCIe throughput? You get a high-performance system that can handle whatever you throw at it, and the lowest possible latency for your sessions. That means you can monitor your performance in sync with the playback for easier, worry-free recording. With Pro Tools | HD Software included, you can compose, record, edit, sequence, and mix music and sound for picture with great speed and ease. Create complex compositions with the integrated Score Editor and MIDI production tools. Track sessions with extremely low latency. And gain inspiration and professional polish from over 75 included effects and virtual instruments. With Pro Tools | HD Native, you gain the flexibility to customize your system for your needs now and in the future. Mix and match HD Series interfaces to work with up to 64 channels of I/O. Add sync capabilities for working with video. Take hands-on control of your mix with an Avid Pro Mixing console or control surface. And expand your sonic palette with a wide range of AAX* plug-ins and software options available from Avid and other third-party audio developers. Use the included Pro Tools | HD software and you™ll maximize your productivity, efficiency, and creative potential, as well as gain unparalleled performance and control of Avid audio and video interfaces, control surfaces, and live sound systems. But you can also use your Pro Tools | HD Native hardware with other Core Audio- and ASIO-compatible DAW software such as Logic, Nuendo, Live, Cubase, Reason, and Fruity Loops”with support for 64 channels of I/O”opening up even more creative avenues.